In our last article we promised to discuss a wrinkle that involved Office 2010 but then didn’t send the article. We didn’t post the article because more information came to light and we were working to iron out the problems. Sorry for the delay but the wait was worth it! If you are installing your OWN copies of our products on your OWN machine, the rest of this article will probably not concern you. If you use our products on a school computer or are installing our products for a number of users, read on. We have worked for many years to allow schools to install the Word Integration (on Windows machines) for all users of the computer. This has been difficult as Microsoft want us to install the integration for all users separately. This has led to a constant battle – we would find a solution and then Microsoft would make a change that broke the solution. Recently, they made a change that broke our solution permanently. In response we have changed our approach entirely and largely given in to the pressure put on us by Microsoft. The result has been better than we had hoped for. We have released new versions of all of our products (release date November 2 2015). These new versions will no longer offer you the option to install the Word integration for All Users of the computer. If you install Word integration from within the installer, it will only install for the current user. This is perfectly acceptable on a single user machine but will not work for multi-user machines. The new versions have a new option in the Help menu. Any user can now integrate the products into Microsoft Word for Windows (2007 and later) at any time. Just select the option and all currently installed products will be integrated. No need for a tech support visit as administrator rights are not required. The integration will appear the next time Word is started. For the technically orientated, this command copies the macro template files into the user’s Roaming profile. This replaces our old system where the templates were stored in a deprecated (but the only available) all user startup location in Word’s directory structure. Network managers installing for large numbers of users can manage this in two ways. 1. 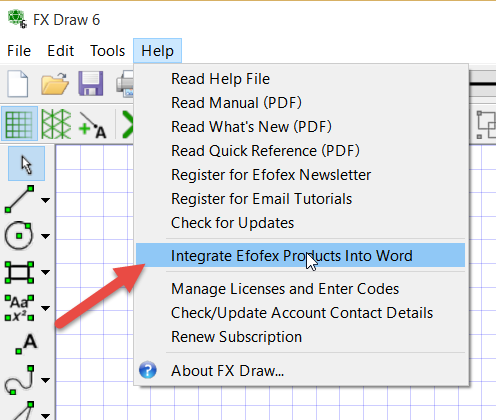 Direct any affected users to start one of the Efofex programs from the Start menu and choose the Integrate option from the Help menu to get their Word integration. 2. If you prefer to add integration automatically, you can use a new command line parameter. Running any of our products with a /word parameter will cause the product to run, perform the integrate step and then close silently. This allows the process to be scripted. You do NOT need to do this for each product as the command will include the integration for all currently installed products. We recommend pointing the new command out to your users as it will allow them to fix most issues themselves. Now, back to the ironing. This entry was posted in Uncategorized and tagged Windows. Bookmark the permalink.